Prins, Herschel 2005. Mental disorder and violent crime: A problematic relationship. Probation Journal, Vol. 52, Issue. 4, p. 333. Hook, Derek 2003. Psychotherapy and ‘ethical sensibility’: towards a history of criticism. International Journal of Psychotherapy, Vol. 8, Issue. 3, p. 195. McCubbin, Michael and Cohen, David 1996. Extremely unbalanced. International Journal of Law and Psychiatry, Vol. 19, Issue. 1, p. 1. Lewis, C. S. (1949) The humanitarian theory of punishment. In God in the Dock: Essays on Theology and Ethics (ed. Hooper, W., 1970), pp. 287–294. Grand Rapids, MI: Eerdmans. Mindham, R. H. S., Scadding, J. G. & Cawley, R. J. (1992) Diagnoses are not diseases. British Journal of Psychiatry, 161, 686–691. New York Times (1992) Stress treatment costs hunter his gun card. New York Times, December 20, p. 34. Syracuse Herald American (1992) Church torcher faces jail or mental hospital. Syracuse Herald American, December 20, p. Ell. Szasz, T. S. (1987) Insanity: The Idea and Its Consequences. New York: Willey. Szasz, T. S. (1991) Diagnoses are not diseases. Lancet, 338, 1574–1576. Szasz, T. S. (1993) A Lexicon of Lunacy. New Brunswick, NJ: Transaction. 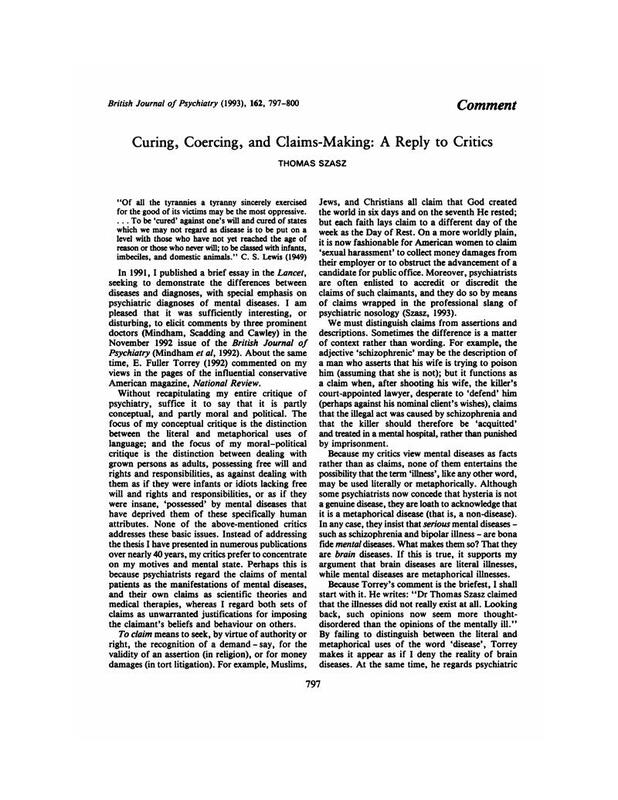 Torrey, E. F. (1992) The mental-health mess. National Review, 44, 22–25.